Dear Earth Talk: What are some ways I can get my college to be more green? In recent years, colleges and universities have recognized the capacity for their independent communities to lead the nation as examples of sustainable and carbon-neutral institutions. Colleges in the U.S.
and around the world have introduced conservation measures to reduce waste, installed solar panels to reduce reliance on fossil fuels, and promoted shared vehicles to reduce carbon emissions, among other initiatives. Many colleges have followed the lead of Stanford University’s “Green Campus” program by replacing disposable plastic utensils with organic alternatives. Cutlery made from potato starch and sugarcane allows students to simply put all waste in compost bins, including the utensils themselves. This compost is reintroduced in turn as fertilizer for use on university gardens. Reusable mug programs accomplish similar goals. At Portland Community College in Oregon, bringing your own mug gets you a five-cent discount per drink, while other colleges with meal plans offer similar incentive programs. And efforts to reduce waste aren’t limited to the dining hall. The University of Illinois Urbana-Champaign and Purdue University have partnered with Kimberly-Clark Professional’s RightCycle program to recycle nonhazardous lab waste. Since joining the program in 2013, the colleges have redirected six tons of plastic waste from landfills for use as shelving, flowerpots and furniture. Meanwhile, 48 different colleges - from Harvard to UC Santa Cruz - have signed on with the Post-Landfill Action Network (PLAN), which helps universities reduce waste through plastic-free initiatives, waste audits and move-in/move-out collections and subsequent sales. Universities can also employ renewable energies to offset power demands from fossil fuels. Campus solar installations have risen dramatically in the past decade. Large, tall structures - the style of many academic buildings - are ideal locations for photovoltaic panels, especially as peak electrical production correlates with peak demand during daytime hours. And photovoltaic installations are not limited to sunny states; Colby College completed a 1.9 megawatt project in 2015 that is currently the largest system in Maine. Other forms of renewable energy have also seen tremendous success on college campuses. A University of New Hampshire project provides over 80 percent of its energy using landfill gas. And Ball State University in Muncie, Indiana has replaced its outdated coal boilers with 3,750 geothermal wells that utilize the Earth’s interior temperature to regulate heat in campus buildings. Colleges have also taken steps to green up transportation. Vermont’s Middlebury College introduced its Yellow Bikes Cooperative in 2001 to offer public bicycles to students for just $6 per year. 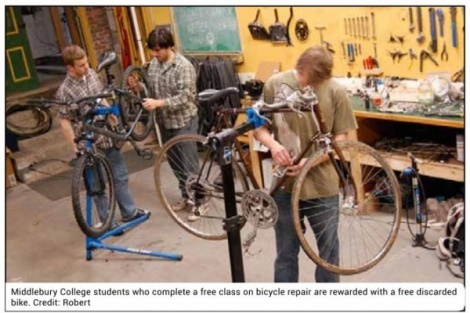 And students there who complete a free class on bicycle repair are rewarded with a free discarded bike. Many colleges also now partner with Zipcar to offer student rates, reducing the need for personal vehicles on campus. And dozens of colleges nationwide have replaced campus car and bus fleets with electric vehicles. These are just a few examples of how higher education is walking the talk on the environment. If your school isn’t already moving in the same direction, there’s no time like the present to team up with students, faculty and administrators to initiate earthfriendly policies and encourage greener behaviors. CONTACTS: Sustainable Stanford, sustainable. stanford.edu; Post-Landfill Action Network, www. postlandfill.org; RightCycle, www.kcprofessional. com/brands/kimtech/rightcycle. EarthTalk® is produced by Roddy Scheer & Doug Moss and is a registered trademark of the nonprofit Earth Action Network. To donate, visit www.earthtalk.org. Send questions to: question@earthtalk.org.